Peninsula also specializes in making metal frame dentures. These are excellent substitute if one of several teeth is missing. Through this type of denture, facial form is preserved and the oral function remains fully supported. We guarantee that our metal dentures are highly durable for long term use. We make it high strength and at the same time comfortable for the wearer. With this dental product, all the remaining teen will be supported. Our metal dentures do not feel cold and look unsightly. All our metal frame dentures are created using medially approved metals such as cobalt chrome and the combination of nylon resin and cobalt chrome. We are also skilled in making metal dentures that mimics the color or your natural teeth for more improved appearance. Our team also takes pride in making metal dentures that are designed for clients with known allergies. Our hypoallergenic metal dentures can totally reduce the possibility of getting an allergic reaction. We assess our clients thoroughly and this includes a discussion about allergies to any kind of metal prior to delivering the right treatment. Almost all our past clients preferred the comfortable and discreet metal frame dentures that we made. With our team, our clients can have a choice whether to have metal clasps or clips that carry the tooth color for enhances denture retention and stability. 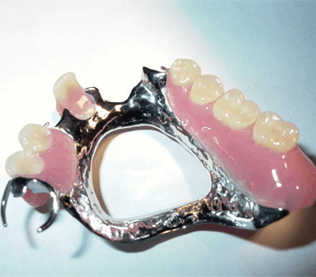 Metal dentures that look like the rest of the natural teeth provide that added confidence. Do not cover the palate and are smaller letting the wearer speak as normal and savor the goodness of food. Are highly durable, strong and do not fracture easily compared to its counterparts. We offer our clients various options to replace their teeth with metal dentures. We offer pure metal dentures that are made from chromium, titanium and even hybrid dentures that are made from combined plastic and metal or nylon resin and metal. Dentures 4 You employs the best dental clinician to make sure the denture material and its fit is just perfect. Our metal dentures are known for its resilience and strength that give clients comfort and teeth replacement for long term. We also guarantee the best solution at a cost that our clients can afford. We discuss the costs and expected results to our clients up front. Our acrylic plastic dentures combined with metal is an economical choice, but not recommended for long term use unlike metal dentures. We provide consultations to help our clients come up with a suitable treatment plan. Once through, our clients are free to discuss and choose the type of materials they would like for their metal frame dentures. We are always happy to help you with your choice! Looking for a dental clinic on the Mornington Peninsula that can determine whether Metal Dentures are suitable for your teeth? Contact us today on (03) 5981 2255 or book online peninsuladentalcare.com.au for a consult so that we can assess your suitability.